I brought this Duvet cover and the matching shower curtain for my master bedroom and bathroom. It is as beautiful on line and in person. The material is gorgeous. I totally would tell everyone that it is worth buying. Featuring hand painted, multicolor flowers, this delightful work of art will brighten up any bedroom while adding a touch of bohemian flair. 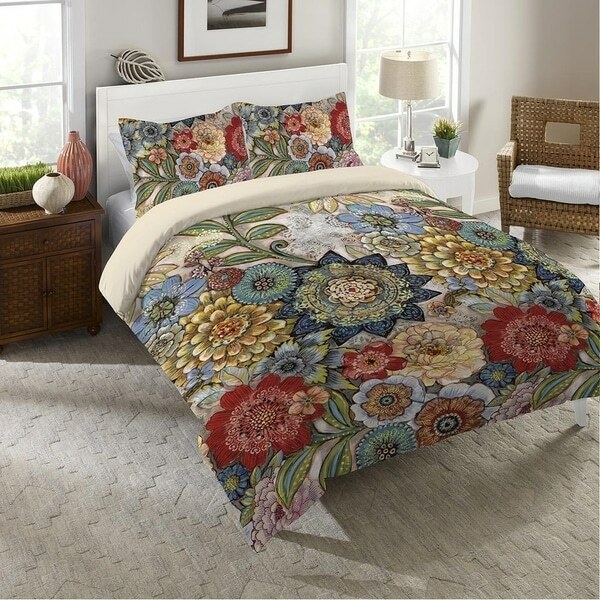 The "Boho Bouquet Duvet Cover and Shams" is made of ultra soft brushed microfiber and its medium weight is perfect for any season. Dimensions 90.0 In. X 104.0 In.